We've all heard the saying, "There are three sides to every story; yours, theirs and the truth." When it comes to the relationships between business and government, accounting firms are usually the go-to place for "the truth part" when it comes to the most important medium in the biz-to-gov conversation, financial information. Yes, there have been examples to the contrary (circa 2008 financial crisis and A+ ratings put on unstable credit default swaps), but for the most part these institutions exist to dig into the numbers and draw out what is really going on, independent of the "he said she said." 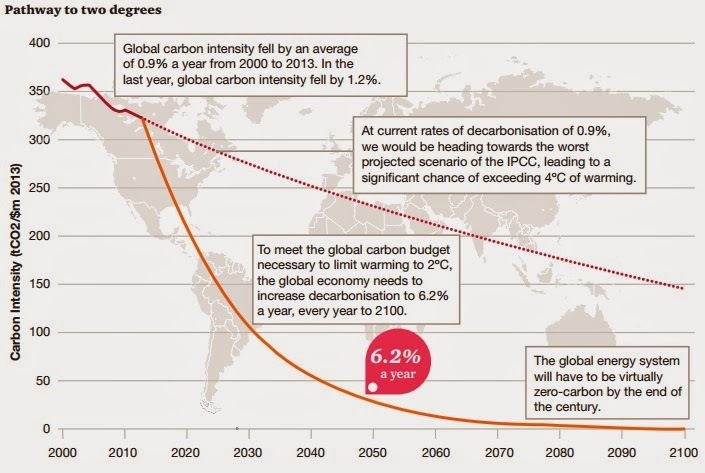 Well, one of the most well know accounting firms in the world, PricewaterhouseCoopers has just released a "high level, easy-to-read" report on Climate Change named, "Two degrees of separation: ambition and reality" that, as a patron of this website, you need to read. Now. Spoiler alert: the news is not encouraging. The report basically spells out that as a global society, we are good at setting long term goals. However, we are not as good at reaching step-by-step milestones in order to reach those long term goals. The most telling chart from the report is shown below. It details how we must reduce the global carbon intensity (tons of CO2 / $m in 2013) in order to limit climate change to only 2 degrees C. This is a 6.2% / yr decrease need. 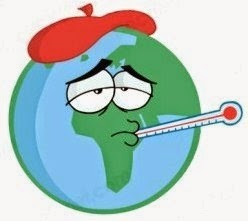 We are currently only achieving 1.2% / yr. Globally, humanity is a D student. I encourage all of you to read this report. It is an easy read, not overly deep into the processes of accounting, and is meant to be read by the average concerned citizen. To me, it is deeply troubling. This is a global problem to which no single government or company can solve itself. The only hope is the cooperation of multiple governments on a coordinated effort to evolve economies into lower carbon producing energy sources for future growth. I hope you review this report and draw your own conclusions. Enjoy. 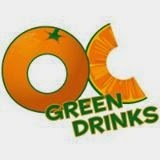 OC Green Drinks mixer tomorrow night in Laguna Beach. See you there! A friendly reminder that the OC Green Drinks October event is tomorrow (October 9, 2014) and Nirvana Grille in Laguna Beach, CA. The even is going on from 6pm till 9pm. Should be a great time getting togeather and talking about all sorts of common interest with great people. More information about the event is at this link. The address is 303 Broadway, Laguna Beach, CA. See you there Brah!